I'm back to working on replenishing my birthday card stash, and these colors looked good for some of the boys in the family. 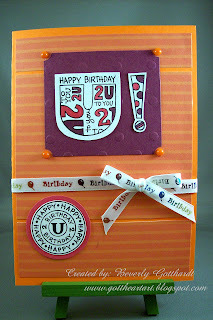 Supplies: Orange Card Blank 5 1/4" X 7 1/4" The Paper Company, Papers: Sunburn Doublesided paper pack, Stampin Up-Rich Razzleberry, Melon Mambo, white card stock, Stamp: Stampendous-SSC648 Two You, Ink: Ranger Archival Ink-Jet Black, Stampin Up markers: Rich Razzleberry, Melon Mambo, Stampin Up: 1 3/4" circle punch, 1 1/2"circle punch, ticket punch, ribbon-Offray, orange sticker dots-Michael's, Stampin Up: Sizzix texture plate-Lg. Dots. Great "guy" card. Thanks for playing along this week. Love these colors together! You have created a great masculine card. Thanks for playing @ PPA! So glad you played @PPA!